"The Eyes, Ears and Voice of the Polish Underground"
Jan Karski died on July 13, 2000, and while the mission of the Jan Karski Educational Foundation focuses on the life of the great Polish emissary, the 18th anniversary of his death gives us an opportunity to recall how people and media reacted to his passing away. Jan Karski was brave; he was resolute; and he demanded of us what he demanded of himself: that we face with clarity the existence of injustice and devil in the world and act with courage to defeat them. Above all, his message was that freedom must be defended. His personal courage and commitment gave weight to his convictions, and his understanding of the would give depth to the personal history he embodied. 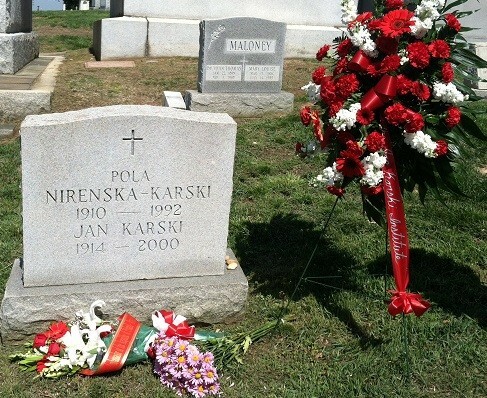 Those who knew Karski will never forget him, and his message will continue to light the path of freedom-loving peoples throughout the years to come. No one could ask for a finer legacy. "Jan Karski: Polish resistance hero who risked his life bringing evidence of the Holocaust to the west"
"Jan Karski, an heroic Catholic-Jew, died on July 13th, aged 86." "Jan Karski Dies at 86; Warned West About Holocaust"